With the ability (as of webOS 3.0) to share a single Palm Profile across multiple webOS devices, users with both a webOS smartphone and a TouchPad are facing new choices regarding app purchases. Yes, the already-purchased apps from the phone will download for free to a new TouchPad using the same Palm Profile, but after that, which version of new apps should they buy? An app meant just for the TouchPad won't run on smaller form factors, while a phone-formatted app will run (if at all) in an awkward emulator window on the TouchPad's larger screen. The alternative, buying both, may not be desireable or economically feasible. Enter the multi-device .ipk, a new developer app packaging option that was recently revealed (and taken out of its NDA status) by the webOS Developer Program. While developers may still create and provide/sell separate versions of their apps for phones and tablets, this new option enables devs to write both types of app but package them together in a single .ipk (the file format for webOS apps) in the App Catalog. When a user buys (or selects, if free) an app packaged in this new way, the device-correct version will be downloaded and installed automatically. Apps packaged in this way will soon appear in the App Catalog (if they haven't already), as developers take advantage of this new functionality. In the future, though, the move to the Enyo development environment for all webOS devices, including built-in scaling and other device-detection features, will make this less of any issue. 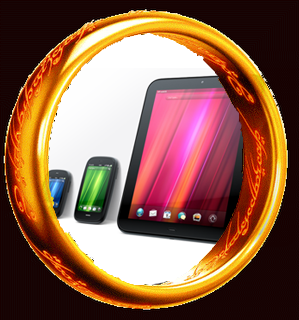 For now, at least, owners of webOS phones who also purchase TouchPads will increasingly discover that (to paraphrase Tolkien) one app will run on them all.